You’ve already been waiting a few minutes, but the site navigation hasn’t finished loading and there’s not a single image to be seen. Instead, a boring gray loading ring or loading bar is taking up the screen. If this is what your visitors see when they visit your website, they have almost no other choice than to leave your site. 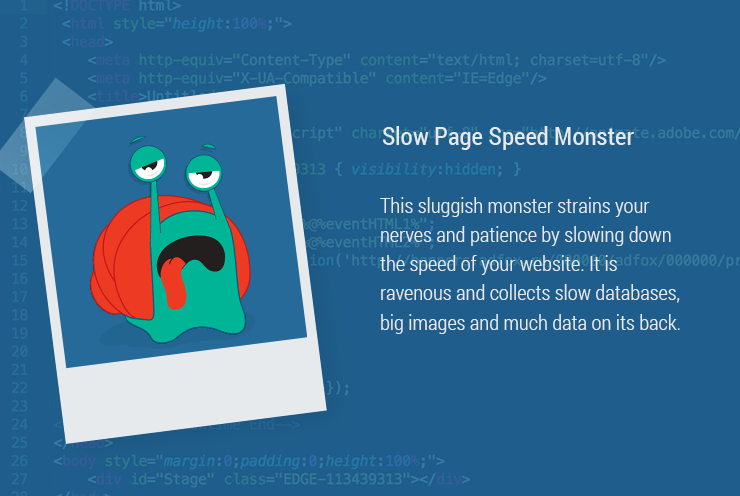 An unmistakable sign that the next monster of daily optimization has attacked: The slow page speed monster! Nothing will sour your users on a first visit more than a slow loading time. Next to a poor user experience, every millisecond more of loading time can mean losses in sales for online shop operators. It is essential that your website has a fast page speed. According to a study from kissmetrics, almost half of Internet users expect a loading time of less than two seconds. If the loading takes more than three seconds, 40 percent of users will leave. The shorter the loading time, the higher the stay time of the user and thus the lower the bounce rate. We will show what you can do when the slow page speed monster is plaguing you. When accessing a website, visitors expect powerful images together with technically-perfect functionality and qualitatively high-quality content. But the longer these elements take to load, the slower the entire website loads. From the diagram from the http-archive in figure 1, it is clear that image and video data make up approximately a quarter of the 2533 kB of average site size. If the display of images is delayed, reading flow and user experience are diminished. Instead, images should be compressed before insertion and formatted correctly. For this, you can use an image processing program such as Gimp. Store high-resolution photos as JPEG; small graphics as GIFs. The study by httparchive also shows the average size of individual file formats. Tip: For image optimization you can use various tools, for example, the freeware jpegtran for JPG files or PNGOUT for PNG files. If you edit your images with Photoshop, there is a simple solution: on the tab “File” under “Export,” simply click on the option “Store for web.” In this way, the images are automatically reduced in size. Using the PageSpeed Insights tool, site speed evaluation can range from 0 points (poor) and 100 points (very good). Sites that score above 85 count as “high performing.” PageSpeed Insights results can change, however, whenever Google updates its rules or methods of analysis. So, it’s worth it to stay up-to-date! The performance report in Ryte’s module Website Success can help you analyze server performance and gives starting points for improvement. The report shows you in one glance which files are causing your server to react slowly. You can then activate filters by clicking on the diagrams, for example “slow”. Next, choose the file type with the highest number. Using the server’s answer time, you can see where things need to improve. The “time to first byte” also tells you which files your server needs too long to react to with crawler or browser inquiries. Goodbye slow loading time – thanks to the above-mentioned tips, and with the help of Ryte, you can do away with this slimy monster! By optimizing your site’s performance level, you increase your chances of standing out from the massive online competition. So, aim for a low processing time from the get-go! Important factors are the HTML structure of a site as well as the proper use of scripts, images, CSS, and JavaSript, among others. You can find an excellent guide to optimizing loading time here in the Ryte Magazine. Have You Met the Other Monsters of Website Optimization? Published on 05/23/2017 by Eva Wagner.